Just in case you’ve never tried this before. Just in case you hadn’t thought of this idea. Just in case you want a breakfast or snack that will make you pass out cold on the floor because it is so delicious. I thought you should know that the Giant Breakfast Cookie recipe made with dried cranberries and white chocolate chips are really, really wonderful. 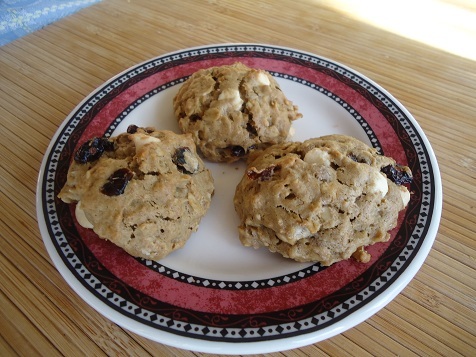 I used about a half cup of each (instead of raisins or chocolate chips) when mixing up the dough. I almost sort of felt guilty eating these and serving them for breakfast. But then I got over it and helped myself to a second one. Where do I get white chocolate chips? I found some at Vitacost that aren’t necessarily as good for you as green beans, but aren’t as horrible as those that have hydrogenated oils. We won’t eat these every day for breakfast, but when we do, I will enjoy myself very much. 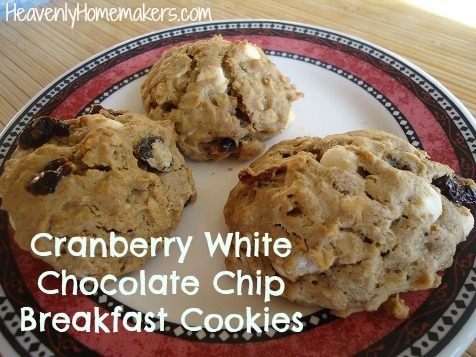 What other tasty combinations have you figured out to add to the Giant Breakfast Cookie recipe? I’m pretty sure I’m going to be making these very soon! This is exactly how I’m planning to make my next batch! Great minds think alike. I just found some mint chips left from Christmas…….really need to use those so that’s what were having. I’m sure they’ll be great! How many cookies do you get out of a batch? Have you tried cutting back the butter with applesauce? I made them last weekend and loved them but was wondering if I could cut back a little on the butter. I did a half craisin half choc chip and they were to die for. A little orange zest would be very good too. I need to make these. I am new to your website and was just reading your breakfast cookie recipe. They sound delicious and I’m sure my two small kids – 3 and 6 will eat them! Do you think I could use almond milk instead of buttermilk? I can’t wait to try these! I think my kids might enjoy them, too (wink, wink). Has anyone tried these with fresh cranberries? I’m not crazy about the taste of the dried cranberries, but ADORE fresh. I have a soy allergy so tried my hand at homemade white chocolate. Success! It’s in my freezer and now I have the perfect recipe to chop it up for – so excited! Thanks, Laura! These work very well to freeze! We have tried these with apples and they are delicious! The last few times I have made these I have did a few things different. I have been making a double batch each time for our family of 7. I have changed some of the ingredients and have been making them Breakfast Bars. The changes have been good and I will continue using them. Wanted to share with you our changes for a double batch. Mix ingredients (except flour and oats) together and then stir in oats then flour. Fold in apples (or chips). Spread into a bar pan or 11×15 greased casserole dish. Bake at 350 degrees for 25-30 minutes. Insert toothpick to make sure they are done. If not add 5-10 more minutes. Cool for 4-5 minutes before cutting into bars and serving.